Everyone is talking about the Scion FR-S like it doesn't offer enough power for the money. Here are ten new cars that may make you rethink that judgement. This is a list of cars that charge you the least for each horsepower they provide. 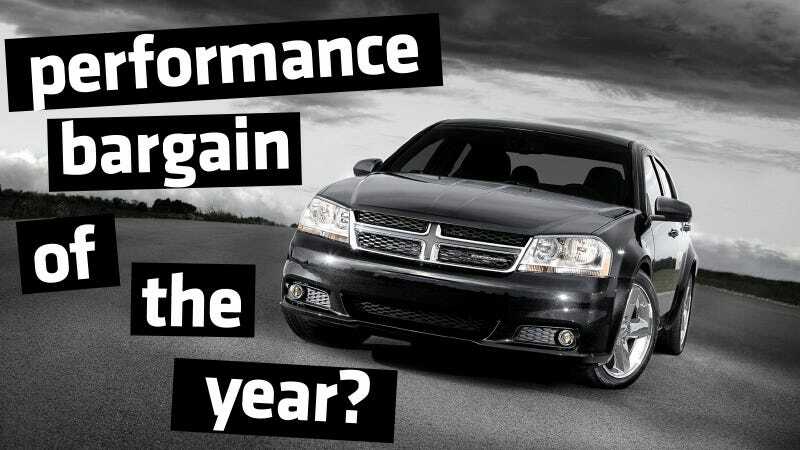 You'll see these cars judged by US dollar/hp, and the lower the number, the better. For instance the Scion FR-S starts at $24,700 and offers 200 horsepower, so that makes it $123/hp. This top ten isn't an absolutely comprehensive list, but it gives you a sense of the market. What you do notice as you go through all the cars is that the cost of horsepower isn't really a good metric for measuring performance car bargains. Cars that you might think as offering a good amount of speed for their price don't even factor in this list. So consider this as a bit of a thought experiment, and see if complaining about a lack of power for your money is really what you should be griping about. Nothing else on the market offers as much power for the price as the 2014 Corvette, right? Well, you'll be surprised by the car that just barely beats in how much you pay per horsepower. Ye, the Corvette's horsepower is just a smidgen more expensive than the horsepower offered by the lowly Nissan Versa. Things will only get weirder from here on out. Of all the hot hatchbacks on sale today, you get the most power for your dollar out of the torque-steer-your-arms-off Mazda. A Fiesta ST is $109/HP and a Focus ST is $94/HP, if you're curious. I have driven the GT500, and I can tell you from experience it is the an irresponsible amount of power not only for its price, but for the street at any price. That doesn't mean it's the cheapest power per dollar of the Mustang family. That honor goes to the lowly V6 Mustang. If you're wondering, this is about $15 per horespower cheaper than the Nissan 370Z and almost exactly $10 per horsepower cheaper than the Hyundai Genesis V6 R-Spec. A Mustang GT? A mere 50 cents more per hp. ...minivan. Yes, get a V6 Caravan at its cheapest (almost certainly not pictured above) and you're getting more horsepower per dollar than any new sports car, supercar, muscle car or pony car on the market today. All hail the Pentastar. There's actually a lot of debate going on about how cheap the Avenger SE with the V6 and six-speed auto combo is. 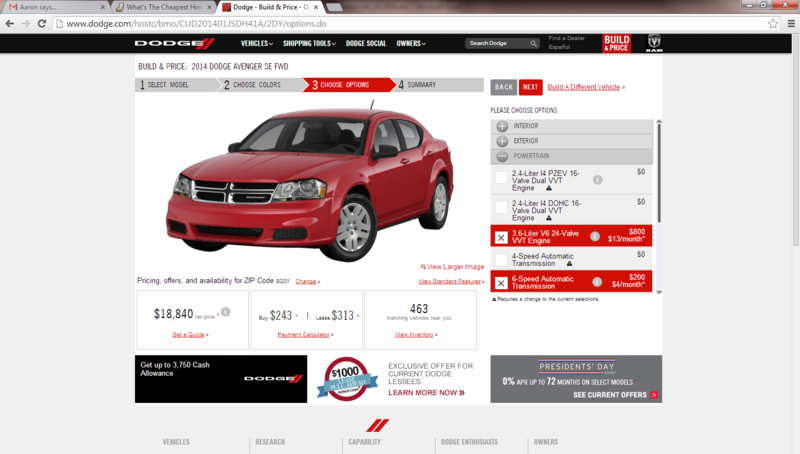 The MSRP is just over $20 grand, I priced the car out into the mid nineteen thousand range, but reader ColoradoFX4 got it down to just $18,840 on the Dodge website (proof is right here). This is the last year of this turd being on the market, so there is absolutely no doubt in my mind you could get one of these things for even less. The question is would you want to? If you happen to order yourself the cheapest Nano on sale, you can get the price below 1.5 lakh, though most are going for 2.36 lakh these days. The Nano is indeed the king of the low power/low cost game. That being said, it's the Land of the Free that beats it with big power, low price. The clear winner in the cheapest horsepower on the new car market is base pickup trucks, and the hemi Ram with a six-speed auto is the cheapest of them all. Next time your friends whine that the FR-S doesn't offer enough power for the price, tell them to get one of these if they're looking for a performance deal. That should piss 'em off. All that being said, there is an effective way to measure the cost of performance, and that's when you factor weight into the equation. Check out this list of cars as measured by dollar-kips/horsepower and you might find your best way of looking at performance bargains on sale. But dollar per horsepower sure ain't the way to do it. Feel free to post your favorite performance car with the worst dollar/hp ratio below, just to hammer the point home.